Chadwick Boseman will soon appear in a second movie as the Marvel superhero Black Panther, but he’s already three movies deep into a different franchise: the Chadwick Boseman Plays Important Figures Of The 20th Century Expanded Universe. After tackling Jackie Robinson in 42 and James Brown in Get On Up, he has moved on to Thurgood Marshall, the Brown v. Board Of Education lawyer and eventual Supreme Court justice. The combination of his portrayal in Marshall with the man’s real-life CV creates a fact-based superhero counterpart to Boseman’s made-up Avenger. Yet Marshall doesn’t quite venerate its subject to excess. 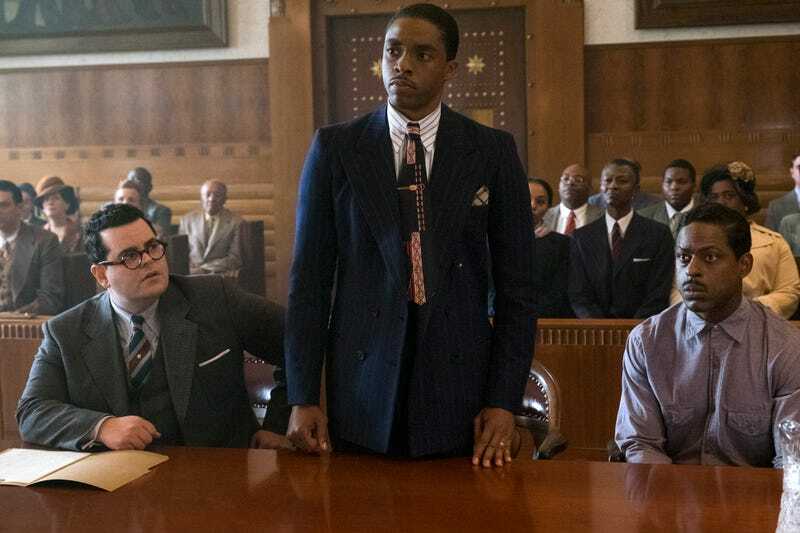 True that this Thurgood Marshall does not undergo a major evolution through the course of the movie, and truer still that having Boseman in this role gives the movie-version Marshall a powerful charisma that holds the screen easily. But Marshall the movie also hands Marshall the man a considerable handicap by focusing on a specific case from relatively early in his career where he was not actually allowed to speak in court. When his employers at the NAACP send Marshall to Bridgeport, Connecticut, to defend Joseph Spell (Sterling K. Brown) of the charge that he raped white socialite Eleanor Strubing (Kate Hudson), a stern judge (James Cromwell) rules that he may not use his New York license to practice law. He’s forced instead to serve as a silent advisor to Sam Friedman (Josh Gad), the timid insurance lawyer who reluctantly agrees to appear in court long enough to turn the case over to Marshall. Friedman is even more reluctant to stick with the case once he realizes he can’t pass it off to his more confident partner. There’s something irresistible about the notion of a powerful orator and skillful arguer forced to work around the muting of that skill set, and Marshall doesn’t fully capitalize on this procedural angle. Though Friedman initially tries not to stick his neck out (pleading for his client to consider a plea deal) and makes a few My Cousin Vinny-ish blunders, he generally adapts to Marshall’s direction and style pretty well. If this transformation isn’t especially dramatic, it also keeps Marshall and Friedman on a more even keel—though Gad is the actor who gets a real character arc, Marshall doesn’t fully turn into a movie about a black man helping a white man become a better person. It has those overtones, but Boseman never cedes the screen to Gad. 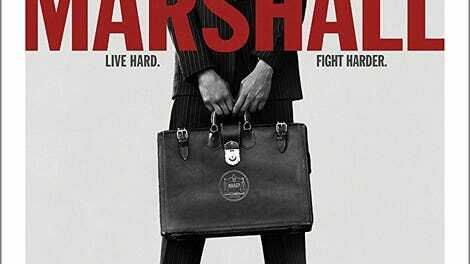 What Marshall does is take the recent slice-of-life style of small-scale biopics and sheds even more biographical details until it becomes a modest but entertaining courtroom thriller. Perhaps sensing the movie’s potential for biopic tedium, director Reginald Hudlin only allows a single scene where Marshall hobnobs with... why, it’s Langston Hughes and Zora Neale Huston (both referred to by their full names, naturally—which is to say, not naturally at all). He even makes the scene bearable by establishing Marshall as, amusingly, borderline disdainful of his former schoolmate turned acclaimed poet. That’s typical of the light touch Hudlin, a veteran movie and TV comedy director, brings to this project. He doesn’t exactly turn a Thurgood Marshall case into a zany brazen-black-guy-and-cautious-white-guy buddy comedy, but the relationship hits some of those notes while moving along too quickly to gather much self-importance, thanks in part to a script that offers dialogue of speed and conviction. Hudlin also has a way of both heroizing and humanizing his subject, often shot from low angles, wearing a jaunty hat, or with a cigarette hanging from his lips with the ease of a star from the movie’s 1940s period. This breezy approach has its limits; Marshall isn’t so different from a well-made TV movie. But it plays well on the big screen anyway, and there’s some relevance in the way it depicts competing forms of bigotry—racism alongside anti-Semitism and expectations about female sexuality. It also touches, however briefly, on the enormity of the task before Marshall and the NAACP, essentially fighting racism on a case-by-case basis. It might be crude to suggest a series of legal thrillers based on the career of Thurgood Marshall, but Marshall makes the idea sound vaguely appealing.